A race series designed to get club members active and foster a little friendly competition! The HOTV Grand Slam is a 4-race series open to any dues-paying member each calendar year. 4) Trail race (any distance). Ideally the races would be local, in/around Corvallis, Salem, Eugene, etc... but if people travel to other races that works too. 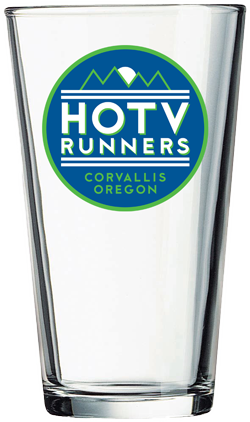 Anyone who completes the challenge will be acknowledged at the HOTV Annual Meeting and Potluck, awarded the prize of a pint glass with HOTV logo on it, and of course have bragging rights for tackling the Grand Slam. You can submit your qualifying race info in the embedded form below, or through the direct link to the submission form.